This was reviewed recently on Cannonball Read and it piqued my interest enough that I not only purchased it, I moved it way up the TBR pile. It is an excellent novel that is let down by it’s execution. The concept is great, the theme is thought provoking and well executed but there are moments where the plot needed tightening and there is one section where the gross prejudices of the author come out in ways that almost stopped me from reading (and stopped many Goodread reviewers, as they all stopped right around the same place). Essentially the book is Agatha Christie by way of Black Mirror and Groundhog Day. 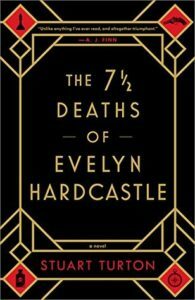 If all three of those appeal to you, then you’ll probably like the book, but if you’re not interested in 1920s/30s murder mysteries set in decaying manor houses with fantastical twists then this isn’t going to be your book. See, Evelyn Hardcastle is going to be murdered tonight at 11PM, and there are three people who have to solve her murder. Not stop it, mind, solve it. They get to relive the day over and over and over again in order to do so. Unfortunately, their minds are wiped at the start of every day so they can’t actually retain any information beyond the 24 hours. Well, except for the protagonist of the story, for whatever reason, he gets to live the day through the POV of 7 different people. The question of ‘can he solve it’ is less important then why he needs to solve it, and the journey to finding the murderer is more important then finding the actual murderer. It’s a really good concept, and for the most part it’s done quite well. I loved the end of the novel a lot, but I don’t want to get into why because it contains spoilers. However, there is a section, during the third POV, that really made me angry. This section contains some really ugly fat phobia. It’s right around the 20% mark, and if you go look at the one star reviews on Goodreads, you’ll see quite a few people stopped reading here. At this point, I needed to know who done it and so read the last chapter in hopes that I could count this one done. Unfortunately, it’s not a who done it murder mystery, as I said the who isn’t as important as the discovery of who, and so I was so confused by that last chapter that I kept reading beyond that section. Ultimately, I’m glad I did but I certainly don’t blame anyone who stopped there. What’s even more frustrating is that I read part of the interview with the author that’s at the end of my Kindle edition, and that fat phobia was an attempt to make this character seem less perfect, to give him a flaw that makes him grotesque. I do recommend this book, and I’m giving it four stars because the concept and theme of the novel really worked for me. I think if it weren’t for the fat phobia, and some areas that let the tension lag a little, I would give this one five stars. Share the post "It’s Not the Destination, It’s the Journey"
I like books, but I'm SUPER picky about them. To clarify- a three star rating means that I liked the book and found nothing objectionable in it. As 3 is the average between 1 and 5 this means the book is an average read, perfectly competent but not outstanding. Everything I had worked for, all my years of study, had been to purchase for myself this one privilege: to see and experience more truths than those given to me by my father, and to use those truths to construct my own mind.